After a shaky first inning and beautiful diving play by Oregon Ducks third baseman Matt Eureste to end the threat, (starting pitcher) David Peterson dialed in to start the second inning of the Saturday game against St. John’s and never looked back. Peterson dealt with some adversity early, as he was not finding a good rhythm with his pitches. However, his perseverance rewarded him the next few trips to the mound, turning him into a different pitcher. Let’s take a look at what made Peterson special during his outing against St. John’s. Peterson got off to a rough start on the mound, dealing with location mistakes and lack of command. 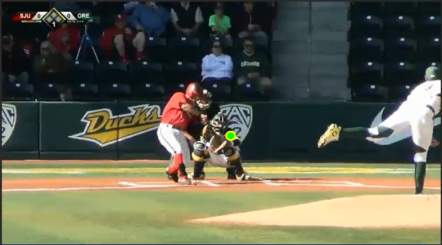 In the image above, Peterson’s pitch was to go inside (as seen from the arrow and dot where the ball should have met the catcher’s glove) to jam the batter resulting in a poor swing or freeze-up to take a strike. Unfortunately, the result went in favor of St. John’s batters, setting them up for a big inning to start the game. Lack of command resulted in Peterson putting himself in a jam. In the above image, Catcher Tim Susnara wanted to go inside, but the ball stayed towards the middle of the plate (Green dot in photo above is where the ball is.) allowing a good swing to send the ball to left field. Mistakes with location loaded the bases for St. John’s, which was looking to deal some damage on the scoreboard at the expense of Peterson. After a visit on the mound from Oregon Head Coach George Horton, Peterson dug down and maneuvered his way out of the jam, leaving St. John’s players scratching their heads. In the second inning, Peterson found his groove and St. John’s day at the plate turned to frustration. In the video above, Peterson threw a curve ball that started high and dipped significantly at the end for a swing and a miss for a strike three. Notice the dip from where the ball was released and how much it curved down into the catching glove. With his first strikeout, Peterson found his rhythm and started dealing. Peterson’s fastball is his bread and butter, but his off speed pitches complement his fastball which are effective when getting a feel for them. It can be downright nasty from the video above. Let’s talk a little about his defensive skills from the video above. Wheeling and dealing since the second inning may have turned Peterson around, but some defensive plays kept the momentum in his favor. Having some height can come in handy when flashing the glove on a big hop to turn a double play. Also worth noting in the video above is the throw by Peterson. Throwing a quick strike to shortstop Daniel Patzlaff allowed him to make a quick exchange from the glove to throw out the runner at first. If Peterson did not make a solid throw to Patzlaff, the runner for St. John’s would have made it to first safely from slow execution. Not only can Peterson pitch, but he has some nice foot work when fielding grounders. In the video above, watch how Peterson fields a bunt. He scoops the ball up, turns, squares up first baseman Brandon Cuddy, and throws a dart for the out at first. For being a left-handed pitcher, momentum tends to go towards the third base line. Peterson, however, gets back into a defensive position from his pitch in reaction to the batter throwing down a bunt, and makes the play. 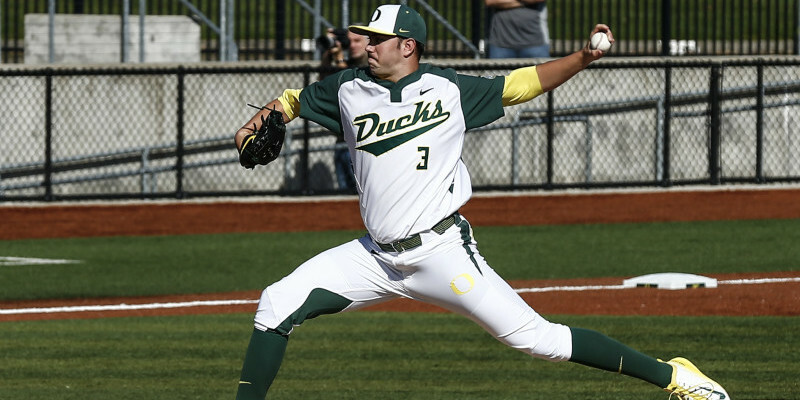 Oregon was in need of quality pitching and so far has gotten solid outings from its pitchers. With being just a freshman, David Peterson has has shown maturity from his early starts. Once finding his groove, Peterson worked efficiently when on the mound and was a force to deal with. Although he left during the eighth with the bases loaded, Peterson put the team in great position to win the game from earlier innings. He definitely has plenty of upside and room to grow into a well-rounded pitcher. Should Peterson gain command early in the game, it will be a rough time at the plate for opponents.